Not to be confused with De doctrina christiana or De Doctrina Christiana (Milton). Cover of the Doctrina Christiana featuring Saint Dominic with the book's full title. Woodcut, c. 1590. The Doctrina Christiana was an early book of Roman Catholic Catechism, written in 1593 by Fray Juan de Plasencia, and is believed to be one of the earliest printed books in the Philippines. ¡The Doctrina Christiana is remarkable not only for having been printed at such an early period in an elaborated blackletter of the Spanish language, but also for having copies made in Tagalog, both in Latin script and the commonly used Baybayin script of the natives at the time, plus another translation in traditional Chinese. Christian Doctrine in Spanish Language And Tagalog, with correct Rules for Religious of the Orders. Printed with Licence (Imprimatur) in (Saint) Gabriel of the Order of (Saint) Dominic. In Manila, 1593. Ang Doktrina Kristiyana sa Wikang Kastila at Tagalog, kasama ang tamang Patakaran para sa Maka-Diyos ng mga Orden. Inilimbag nang may Lisensya sa San Gabriel ng Orden ni Santo Domingo. Sa Maynila, 1593. There is some controversy about which of the versions is the first printed book in Spanish Philippines, with some scholars believing that the Chinese-language version titled Doctrina Christiana en letra y lengua China, compuesta por los madres ministros de los Sangleyes, de la Orden de Sancto Domingo. Con licencia, por Keng Yong, China, en el Parian de Manila (Chinese: 新刻僧師高母羡撰無極天主正教真傳實錄; pinyin: Xīnkè Sēngshī Gāomǔ-xiàn Zhuàn Wújí Tiānzhǔ Zhèngjiào Zhēnchuán Shílù; Wade–Giles: Hsin1k'o4 Seng1shih1 Kao1mu3-hsien4 Chuan4 Wu2chi2 T'ien1chu3 Cheng4chiao4 Chen1ch'uan2 Shih2lu4; literally: "A Printed Edition of The True Faith in The Infinite God, by Fr. Juan Cobo, O.P.") by Fray Miguel de Benavides, OP, was printed between 1590 to 1592 by the Chinese printer Keng Yong in Manila before the Spanish and Tagalog versions. Missionary fathers placed the Doctrina among the books necessary to have in print in foreign lands. As such, the Filipino book is similar to one printed in Mexico in 1539 in Spanish and local Mexican vernacular, followed by Saint Francis Xavier’s Doutrina Christão in Malay printed by the Jesuit press at Goa in 1557. 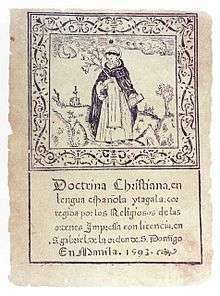 Another Doctrina was printed in Spanish and the native languages at Lima in 1584. Apart from the copy in the Library of Congress in Washington, DC, there are no other known copies in existence today. Both the quality of the paper, age, natural agents and disasters such as earthquakes and fires all contributed to the disappearance of most printed copies. The only known existing copies of early Philippine books are those sent to Europe during the 16th, 17th, and 18th centuries, which may lie uncatalogued in some library. Such was the case for the copy sent to Philip II of Spain by the Governor-General Dasmariñas in 1593. This is believed to be the same copy that reappeared in 1946 in the possession of a Parisian bookseller and collector who specialised in Pacific imprints. William H. Schab, a New York City dealer, purchased the book and took it to the United States, where he resold it to Lessing J. Rosenwald, who in turn presented it to the Library of Congress where it remains today. The only known surviving copy of the Chinese version is stored at the Biblioteca Nacional in Madrid. The title literally means “Christian Doctrine”, and thus the primary goal of the book was to propagate Christian teaching across the Philippine archipelago. The book consists of 38 leaves and 74 pages of text in Spanish, Tagalog transliterated into roman letters, and Tagalog in its original Baybayin script, under a woodcut of Saint Dominic, with the verso originally blank, although in contemporary versions bears the manuscript inscription, "Tassada en dos reales", signed Juan de Cuellar. After a syllabary comes the basic prayers: the Lord's Prayer, Hail Mary, Credo, and the Salve Regina. Following these are Articles of Faith, the Ten Commandments, Commandments of the Holy Church, Sacraments of the Holy Church, Seven Mortal Sins, Fourteen Works of Charity, the Confiteor and a brief Catechism. The book was printed on paper made from mulberry. The size of the volume, which is unbound, is 9⅛ by 7 inches, although individual leaves vary somewhat due to chipping. Some of the leaves have become separated from their complements, but enough remain in the original stitching to indicate that the book was originally made up in four gatherings, the first of twelve leaves, the second of ten, the third of ten, and the fourth of six. Although the book is of the size called quarto, the method of printing must have been page by page, so it is doubtful that each sheet was folded twice in the usual quarto manner, but more probable that it was printed four pages to a sheet of paper approximately 9⅛ by 14 inches, which was folded once. The volume was printed using the xylographic technique, printing each page of text from one hand carved woodblock. Vertical lines long the inner margins of some pages were made by the inked edge of the block, and the grain of the wood appears as striations throughout the printed areas. ↑ Lessing J. Rosenwald. "Lessing J. Rosenwald Collection". Library of Congress. World Digital Library. Retrieved 2010-11-28. ↑ Retana, Wenceslao (1894). La Politica de España en Filipinas, No. 97. Manila. ↑ Pardo De Tavera, Trinidad (1893). Noticias sobre La Imprenta y el Grabado en Filipinas. Madrid. pp. 9–10.